Thread: Low Buck easy multi use rotary fixture! Years a ago I was rebuilding Chevy 4 bolt 350's for the trucks me and the kids had seems that had one in the process just in case when you buy and drive older trucks. I had two of these from HF. When the daughter got something else, and the son moved on to Jeeps. I took em apart and put them in the shed. I don't like selling tools as I always seem to need the items 10 minutes after they are driven away! With the 25% off coupon it was a savings of $180.00 and it is good enough to haul it locally and the cambro boxes along with a supply of the wood, tables and some other small items. 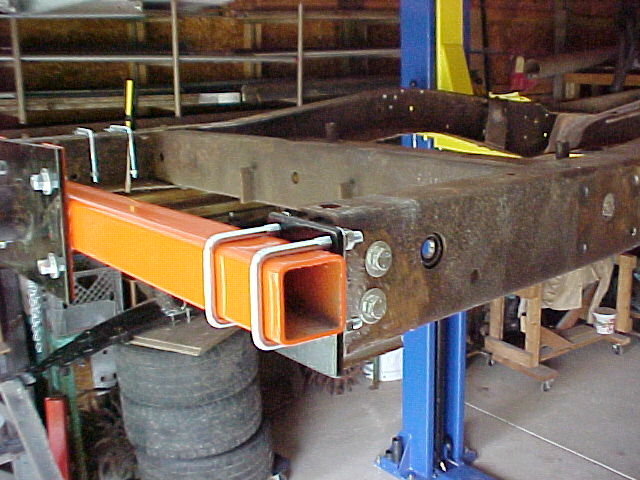 The frame steel is about 1/8" thick, and can be modified for his needs with out removing anything parts. 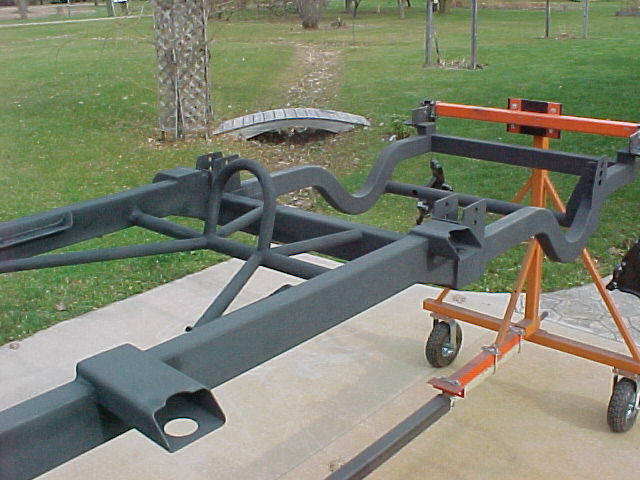 Knowing that most people tend to over load the trailers, just a little I took the springs up to the local spring joint and had them put an extra leaf in each side. so much easier that after they have been on a while. I had always thought that the engine stands could make a good light weight home owner/hobbyist Rotary welding/work fixture! I still have to find some bar stock with holes in them to mount the frame to the engine mounts to replace the C-clamps so it can rotate 360°. With the current 25% off coupon from the HF wiki site it brings the price down for the two of them. About $45.00 each a lot better that the import rotaries sold by the car places. If you have a problem with HF buy them where you want! Been there, probably broke it, doing that! While you're at it you might want to put in some real wheel bearings .. don't ask me how I know ..
Nice idea Glen. Never thought if that. It might be even handier if it had swivel casters on both ends of one of the engine stands. I'm sure it would, plus some weight on each since one person turning the item over tends to move one more than the other . Must be the rust have to shoot it with some breakaway to free things up. I marked the center line on each stand and then the end rails to get the balance good. Here is the frame flipped right side up. This is a good solution for me mostly working by my self. 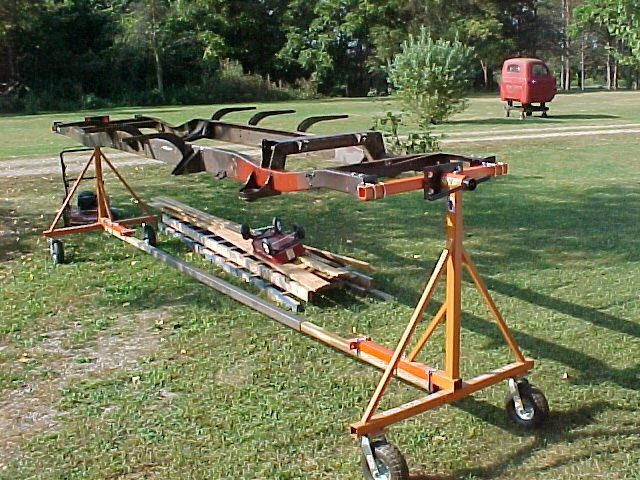 Along with the cherry picker, lift table, motorcycle lift, and the garden tractor hoist/lift I find I can do about any thing I need to do. That's a very clever use of those stands. I did the same thing a few years ago. I cut up a couple of stands I got from Car Quest for $35 each. Made them taller, widened the foot print and took the head angle out. They handle bare frames beautifully! I made a couple of bars that bolt to the rotisserie head with some adapter brackets that bolt to the rails and are held on with 2" x 2" U bolts. This worked very well. 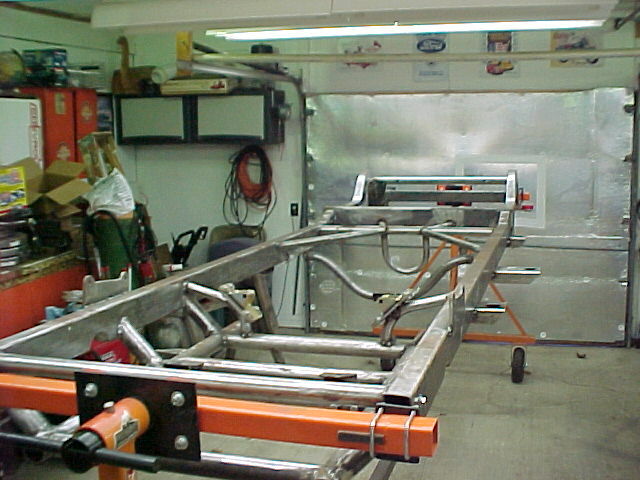 Here is a shot with a '49 Ford F1 frame installed. This rig made it a breeze cleaning and painting the frame. Actually enjoyable, if you know what I mean. Here are some pics with a frame I built for my Astro van. Astro Van with a custom frame...tell us more! Plus one. An Astro Van???? An Astro van with a Driveshaft saftey hanger, could this be a drag car/van?